The US dollar rallied on Tuesday as markets turned attention back towards slowing growth in emerging economies. A research note from the Asian Development Bank stirred markets and turned investors’ minds back towards the situation in China. The US dollar gained, as did the yen. The euro, sterling and commodity linked currencies retreated. Major stock indices fell sharply in a global sell off. The S&P 500 fell by more than two percent. The UK FTSE-100 fell by nearly three percent and the German DAX by nearly four percent. Commodities fell abruptly but crude oil futures began to recover in late trade. 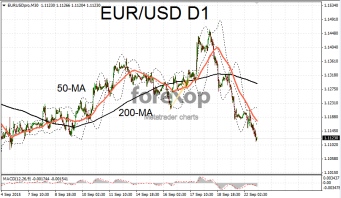 The euro fell one percent as traders bet the single currency will suffer disproportionately in an environment of declining prices and slower growth. The prospects of a ramping up of the ECB’s quantitative easing program also loomed heavily on investors’ minds. 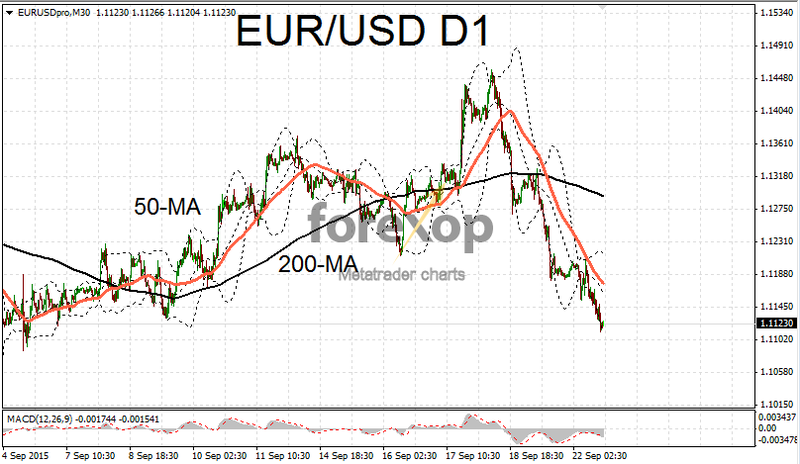 EUR/USD extended yesterday’s losses with a fall below the 1.12 barrier. Minor support looks probable around the 1.1082 area. Tomorrow will see the release of the latest flash purchasing managers’ surveys for the services and manufacturing sectors. The PMI reports are closely watched as they provide a lead indication of activity in the corresponding sectors. German manufacturing will be closely scrutinized. A poll of economists predicts a slight fall on August’s number to 52.8. Apart from the economic data the trajectory of EUR/USD this week looks set to be determined by global events and risk positioning. Of the major currencies only the yen gained on the US dollar. USD/JPY briefly slipped back beneath 120 as traders hunkered down amid a global sell off on risk assets. Metals and crude oil fell sharply and this had an impact on the commodity pairs. AUD, NZD and CAD were all weaker with the US dollar and Japanese yen mopping up most of returning liquidity. Carry traders have suffered heavily in this downmarket. The New Zealand dollar was testing six year lows against the greenback. NZD/USD pushed as low as 0.6270. Likewise the Australian dollar extended its fall against the greenback. AUD/USD was testing the lower end of the 0.7000 range. A failed break above the 50-day moving average has seen the pair retreat back towards the long term bearish trend.